Sometimes when learning to read the tarot, some cards can be a little difficult to fully grasp what their essence is, leaving us feeling a bit foggy as to how to interpret what it may be trying to tell us. Here is a little trick I learned that not only brings clarification but also a deeper insight into how to truly connect and develop valuable insights that any given card is trying to express. For several years, I’ve been attracted to the Crowley/Harris Thoth Tarot but always felt hesitant because I felt that it was a bit too advanced for me after years of study and reading with the Rider Waite Tarot. I finally bought this wonderful deck a few weeks ago and am totally smitten with it. It isn’t nearly as complicated as I worked myself up to believe plus it’s an amazing deck for anyone who loves to delve deeply into spiritual and intellectual insights. As I’ve been studying this deck, I began to notice that some cards seemed to be a tad hazy as to just how they fit into what questions or concepts I was asking about. The Six of Swords happened to be one of those cards that somehow seemed to elude me as to what exactly it was trying to impart. So, I decided to try this little trick in order to gain a clearer understanding of it’s message. Wow, on the surface that sounds pretty straightforward, but what does all that really mean? 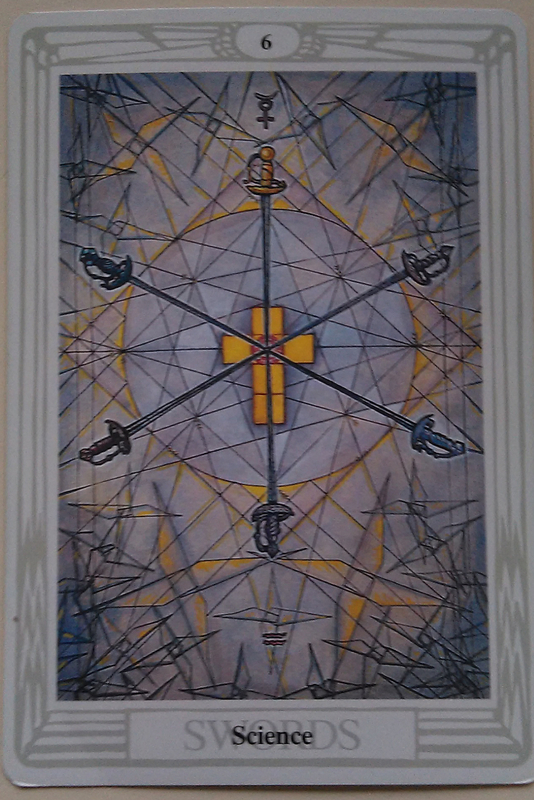 Deep down, how do I connect with the Six of Swords so that I can gain a deeper perspective of its message? I pulled… the Prince of Cups; the Seven of Wands and the Magus. Now Princes, ( Knights in the Rider-Waite deck) I usually always see as acts of “doing,” meaning riding off in to the sunset in search of something, whether it be active or passive they all appear to be involved in some type of movement. This Prince (Knight) is involved in the act of feeling, signified by his suit of Cups, which are the element of Water and deal with the realm of emotions and feelings. His message is one of connecting with our deepest emotions, the drive to reach out and experience our higher selves. The final card, the Magus, being a Major Arcana card indicates a higher lesson to be learned. A lesson that the Universe is trying to tell us is important to understand. When we look at the Magus, the first thing we notice is that he holds all the symbols of the four elements, Wand (Fire); Cup (Water); Sword (Air) and Disk (Earth). Together, you might say he has a holistic view of his abilities and talents, he sees the whole picture because he has all the components that make up that picture. Together, he has the tools needed to blaze the trail to self realization. In essence, in order to get an idea of the total concept, you must have the tools to see all sides. An elevated view of any given situation, in this case, it let’s us know that we are able to grasp the entire concept as well as the ability to explain it to others as well. 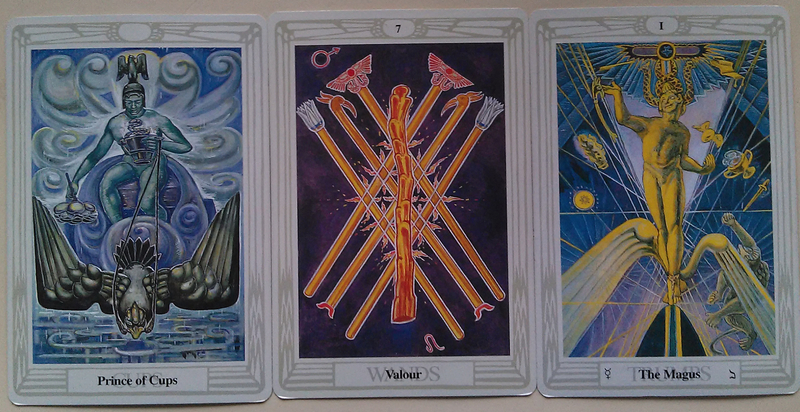 So now we can see the three cards that I drew, when applied to the need of a deeper understanding of the Six of Swords, gives us a richer, more rewarding connection. This is a lovely deck! For me, a bit difficult to use, but I like its highly esoteric nature. Interesting take on the Thoth Tarot!